Our bomber force is a farce and while the Karas bomber could be available in late 1935-early 1936 we need some interim solution. Let the games began. Or the older T.Va bomber which it will replace. Atlantis can offer the following designs. Armament 2x20mm cannon, 3x 13mm HMG, 2x 500lb bombs underwing. 8mm rear armoured bulkhead. Armament four wing mounted 7.7mm Mg and two fuselage mounted 13mm HMG and one 500lb or 1000lb bomb underfuselage. What sort of bombers does Poland want? Light, Medium, Heavy? I'm sure that Italy can offer in all categories. I wonder what kind of sinister plans Poland has in mind. After all, this is a 'Land Equipment' post. Maybe something like pushing the planes toward the enemy position and cut up anyone stupid enough to attack this groundcrawler with the propellors and once the plane is in position, detonate the bombload inside. offers a range of light and medium bombers. Heavy bombers are not yet approved for export. The Karas is an interesting aircraft, though the export version (the P.43 version, built for Bulgaria) is better and the P.37 Los is quite a bit better still. If Poland is looking to fill gaps while the production of the P.23 gets under way, Germany really can't help, unless Poland wants to lease or buy some He-45s to train pilots and observers on, by the time Poland could take delivery of any new built aircraft the Karas will be ready. within a few months. 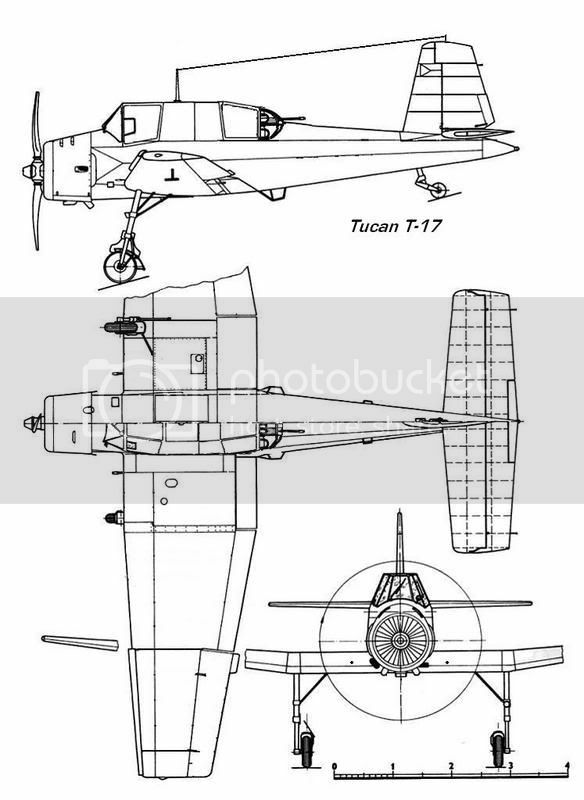 The Argentine firm of Tucan can offer the ground attack aircraft the T-17 for army support. A light basic monoplane support bomber. Armament two fixed wing-mounted 7.62mm MG, one dorsal 7.62mm MG and 150kg (330lbs) bombload. Crew protected by 5mm armoured 'bathtub'. I agree somewhat. By the time the Karas is available (early 1936) is true they could be build in quantity (IIRC close to 90 per year from 1936 to 39 counting exports) but to fill the gap and to replace the really obsolent Potez and least an interim solution needs to be found and purchasing at least 36 to 60 bombers is a short term solution. Will not see an increment on the size of the Polish Air Force due to the phasing out of the older aircrafts on a one to one basis. Hmmmm. An inexpensive fill-in might be to lease or buy some light bombers then. Henschel could probably boost production on the Hs-123 enough to get planes in Poland's hands SOON (starting in November or so), without putting itself behind its commitments to the Luftwaffe. Starting delivery in November 34? An order of 48 will be more than fine if all aircrafts could be completed by the middle of the next year. Poland also orders 15 Dutch bombers (to fill an squadron, have spares and one for evaluation) and 3 of the Spartan Sp21 for evaluation. 48 Hs-123s can be delivered to Poland by the end of May, 1935. Two Wright R-1820-33 Cyclone air-cooled radial engines, rated at 775 hp for takeoff and 750 hp at 5400 feet. Maximum speed 213 mph at 10,000 feet, 196 mph at sea level. An altitude of 5000 feet could be attained in 3.4 minutes. Normal range 590 miles, maximum range 1240 miles, ferry range 1830 miles. Weights: 9681 pounds empty, 14,600 pounds gross, 16,400 pounds maximum. Dimensions: wingspan 70 feet 6 inches, length 44 feet 9 inches, height 15 feet 5 inches, wing area 678 square feet. One 0.30-inch Browning machine gun in nose turret, one 0.30-inch Browning machine gun in flexible mount in dorsal gunner position, and one 0.30-inch Browning machine gun in a ventral tunnel position mounted in the floor of the fuselage behind the bomb bay. 2260 pounds of bombs could be carried. Four Wright R-1820-51 Cyclone radial engines rated at 1200 hp for takeoff. Performance: Maximum speed 292 mph at 25,000 feet. Dimensions: Wingspan 103 feet 9 3/8 inches, length 67 feet 10.2 inches, height 15 feet 5 inches, wing area 1420 square feet. Weights: 27,652 pounds empty, 37,997 pounds gross, 46,178 pounds maximum. Armed with five 0.30-inch machine guns, with one gun in each of nose, dorsal, ventral, and two waist positions. A maximum of eight 600 pound bombs could be carried in an internal bomb bay. Two Wright R-1820-53 air cooled radials, rated at 1000 hp for takeoff and 850 hp at 9600 feet. Maximum speed 215.5 mph at 10,000 feet. Initial climb rate 1030 feet per minute. An altitude of 10,000 feet could be attained in 9.9 minutes. Range was 1150 miles with 2496 pounds of bombs. Dimensions: wingspan 89 feet 6 inches, length 57 feet 10 inches, height 15 feet 2 inches, wing area 959 square feet. Weights: 16,321 pounds empty, 22,123 pounds gross, 27,673 pounds pounds maximum takeoff. Normal bombload was 2200 pounds, but a maximum bombload of 4400 pounds could be carried. Armed with three 0.30-inch machine guns in nose, dorsal, and ventral positions. Two Pratt & Whitney R-2180-1 radials, rated at 1200 hp for takeoff. Performance: Maximum speed 220 mph at 10,000 feet. Cruising speed 190 mph. Service ceiling 25,000 feet. An altitude of 10,000 feet could be attained in 10 minutes. Range was 1960 miles with 2200 pounds of bombs, 660 miles with 10,000 pounds of bombs. Maximum range 3100 miles. Weights: 19,082 pounds empty, 27,253 pounds gross, 40,000 pounds maximum. Dimensions: Wingspan 95 feet, length 61 feet 9 inches, height 14 feet 9 inches, wing area 1120 square feet. Armed with a 0.30-inch machine gun mounted in power turrets in the nose and in the rear dorsal positions, plus one 0.30-inch machine gun firing from a ventral hatch and from left and right waist positions. The B-10 had been in production for several years and is immediately available. The B-17 and B-18 are in early production and may be delayed until 1935. The B-21 has just entered testing and won't be ready till late 1935 at the earliest. We also have the B-16 being built for Brazil as a maritime recon plane, but it would probably be well in excess of Poland's needs. While a little belated, a lighter bomber than most of these would be Fokker-America aka Atlantic Aircraft 's FA-10, available in 1935. Designed with lower altitude ground support in mind, it's a hypothetical follow-on to XA-7. Designed as long range light dive bomber with moderate speed. Range is 1400km, and 4.8hr flight time. 10mm armor disk, 2x 7.92mm fore, 2x7.92mm dorsal turret, 1000kg bomb load for radius. Poland could be interested in sixteen for "evaluation" purposes.